Product Profile: Brimming with essential fatty acids such as DHA and EPA, Reboun.. REBOUND Flaxseed Oil 1000mg is an organic, rich and natural plant-based source of omega fatty acids, packed with benefits for hair, skin and cardiovascular health. Alpha linoleic acid (ALA) is partially metabolised into other omega 3 fatty acids DHA and EPA. Together with linoleic acid, they enhance you complexion by improving skin texture and softness. Skin cells are kept moist and strong, as these essential fatty acid (EFAs) help to reduce water loss through the skin’s top layer. They also increase production of collagen, which is essential for firm and healthy hair, skin and nails. The omega fatty acids also have other unique properties. ALA contributes to brain and nerve tissue development, linoleic acid helps to reduce body fat, while oleic acid aids antioxidant production. 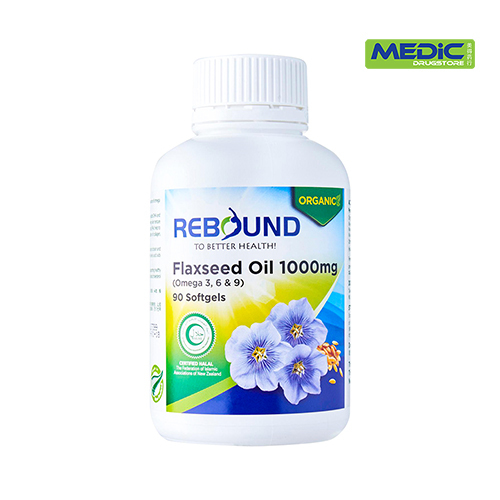 Rebound Flaxseed Oil 1000mg, helps to protect cardiovascular health by supporting healthy blood pressure, blood vessel and capillary health. It also promotes healthy blood cholesterol and nourishes dry hair, skin and nails for a healthier complexion. Take 1 soft gel 3 times daily or as directed by a doctor. Rebound Flaxseed Oil 1000mg (Omega 3, 6, 9) is made in Good Manufacturing Practice (GMP) facilities to ensure that the highest quality product is produced. The product also have been certified Halal issued by The Federation of Islamic Associations of New Zealand. Ingredients Per softgel contains: Organic Flaxseed Oil 1000mg (Equivalent Linolenic acid: 500mg, equivalent Linoleic acid: 135mg, equivalent oleic acid 135mg). Other ingredients: Vitamin E (Equiv. Natural Vitamin E 1.3 IU/Cap) Gelatin (Halal), Glycerin, Purified water. Free from artificial flavours, artificial colours, gluten, wheat, lactose, preservatives, added sugar and yeast.